FILE - European Union flags fly outside the European Commission headquarters in Brussels, Belgium, March 6, 2019. EU member states should be empowered to scrutinize each other's democratic track record, Germany and Belgium said Tuesday, in an attempt to beef up the bloc's defenses against nationalist, populist governments flouting its key principles. The proposal, made at a meeting of EU ministers, coincides with high-profile EU investigations against Poland and Hungary for undermining the independence of their courts and media, while Romania is accused of rolling back on anti-graft reforms. Germany and Belgium say their proposal would create space for member states to flag rule-of-law concerns early on rather than wait — as at present — for problems to escalate enough in a given country to trigger the EU's existing mechanism — the complex and multi-stage Article 7. The EU has invoked Article 7 to investigate concerns that Poland's nationalist government has undermined the rule of law. The process could theoretically lead to Poland losing its voting rights in the EU, but it has now lain largely dormant for months. EU states have been unable to agree since last autumn on how to proceed with a similar inquiry into Hungary. FILE - Belgium's Foreign Minister Didier Reynders, left, talks with Germany's Minister of State Michael Roth during an EU general affairs meeting, at the European Council building in Brussels, May 13, 2014. Acknowledging the hurdles their proposal is likely to face, Germany and Belgium suggested the new screening procedure would only be voluntary and carry no sanction. "The EU is a union of values. It is not only about the single market," Germany's EU minister Michael Roth said in presenting the plan for an annual peer review. "Everybody has to adhere to those values, they are not just nice-to-have." 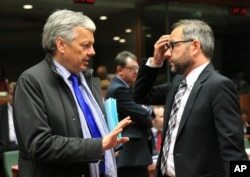 Belgian Foreign Minister Didier Reynders said he hoped the new mechanism would be fleshed out by the end of the year. It was swiftly backed by the Netherlands. The health and resilience of EU democracies are in focus ahead of European Parliament elections in May, in which pro-EU parties face off against euroskeptics who promote nationalist and populist policies that at times go against the liberal democratic values of the bloc. The EU's main center-right group, the European People's Party, is due to decide on Wednesday whether to expel the Fidesz party of Hungarian Prime Minister Viktor Orban over his anti-EU, anti-immigration campaigns. Both Warsaw and Budapest have sometimes yielded to EU pressure, offering concessions in their push to centralize more powers. But the EU has been largely unsuccessful in preventing them from tightening controls on the judiciary, media and civil society groups.